The 1 oz Gold Krugerrand Coin is minted in 22-karat gold (.9167 fine) by the South African Mint Company. Alloyed with copper for exceptional wear-resistance, this gold coin has a beautiful rose-tinted hue. First minted in 1967, the Gold Krugerrand Coin was for many years the only gold bullion coin available in the market. Unlike most gold bullion coins from national mints, Krugerrands, since their first mintage have had no face value or denomination because their value was linked to the daily gold price. The history of the South African Mint goes back to the opening of the first state mint in Pretoria in 1892. The current South African Mint came into being in 1941 when the South African government took over the Pretoria branch of the Royal Mint. You can store your 1 oz Gold Krugerrand Coins safely and securely with Kitco Allocated Storage. Kitco offers global options for gold bullion storage that are fully segregated, insured and allocated. Kitco Metals' network of top-tier gold vaults includes some of the most secure storage facilities located in Canada, Hong Kong or the United States (COMEX approved). Cayman Islands gold storage is also available (certain conditions apply). Find out more about keeping your gold coin holdings secure, with our Global Precious Metals Storage Solutions. Why buy Gold Krugerrands from Kitco? 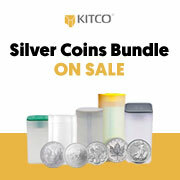 Kitco is a highly trusted leader in the gold bullion coin and physical precious metals industry. Gold coins and other precious metals sold to Kitco are recognized in gold bullion markets around the world. With our focus on gold coins and gold bullion products, you can benefit from our competitive gold prices and premiums within the gold bullion industry. The Gold Krugerrand Coin(s) you receive may not be in mint condition. The Gold Krugerrand(s) you receive may be from a different year’s mintage and its appearance may be slightly different from the Gold Krugerrand Coin illustrated here.